Here is a slot game that knows what we want. The graphics are unfussy and standard, but the features and bonuses available are exceptional. With more than enough features to keep you entertained and playing on, you’ll find extras all over the place, allowing you to win even more than is initially on offer. As the Price Is Right slot starts, the musical introduction holds the allure of past Saturday evening's, when one was younger and settled in with family to watch the evening's game-shows. 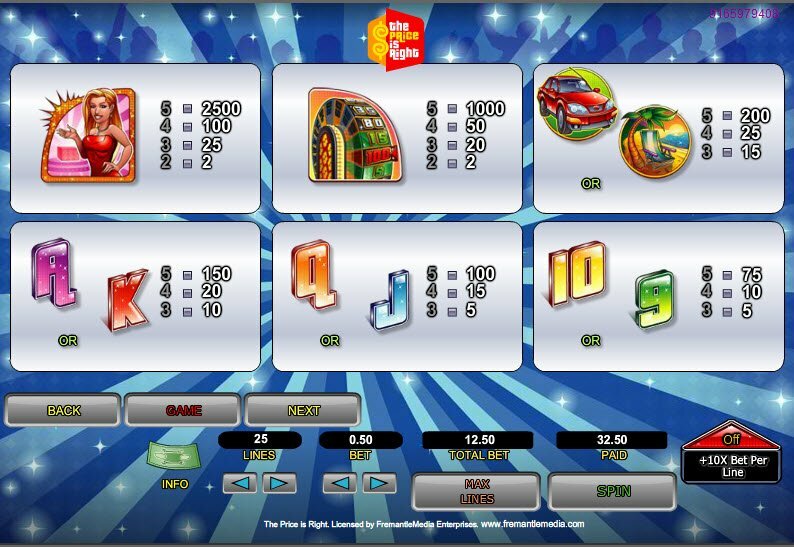 The Price Is Right is a 5-Reel, 25 payline slot, and like most slot games, it pays left to right. However, scatter symbols throw everything off whack, and you will be able to spin those reels into payouts wherever a scatter symbol lands. This game is all about the showy, sparkly features, and not so much about the graphics, so I'll get right down to them! Our host appears on reels 2, 3 and 4 to substitute for all other symbols, except for the scatter symbol. He will trigger The Price Is Right Slot Bonus Mini Game. You will then be able to choose from the exciting Secret X feature, or the Cliff Hangers features. The Secret X feature will reveal a grid of squares, with 3 question marks, one of them covering an X. Choose from one of the other squares and, you will have to value an item to receive a third x to make a line and trigger a 50x win. Even if you don't succeed, you'll still get a 15x win. 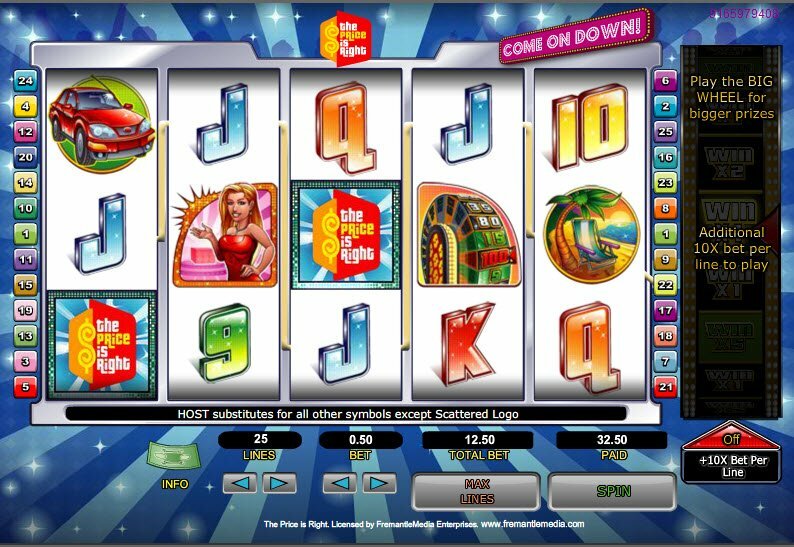 The Price Is Right is a 5-Reel, 25 payline slot, and like most slot games, it pays left to right. 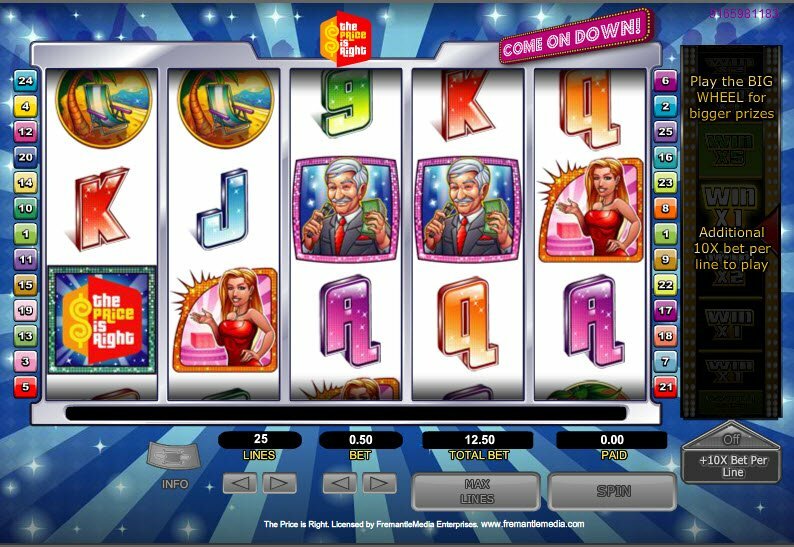 The Cliff Hangers feature will ravish you with 8 the Price Is Right slot free spins, then will take you on a hike to see how many more free spins you can gather, if your climber falls, he'll spin you into a couple more free spins. There's The Price Is Right Big Wheel Feature, triggered if you play at 25 lines, plus 10 times your current bet value. The big wheel will spin alongside each game and, wherever the arrow stops on the wheel, you will receive whatever it is pointing to; whether it be a mini game feature or multipliers. Multipliers will be applied to any wins on the spin you reeled in. The Showcase feature triggers when 2 scattered logos appear and a board will appear with a car symbol locked in. You'll need to place a range of items from lowest value to highest to be awarded with a 100x multiplier if you are successful.